Folks out in the boonies like me—the nearest city is 25-miles down the road, and it's a city of 150,000 or so—find themselves shopping on the Internet more often than not. My quest was for a new pair, a colorful new pair, of Chuck Taylor Converse All-Stars. I have a red pair. I have a green pair. I have a solid black pair for formal occasions. I wear Converse All-Stars every day, having learned that the soft canvas shoe is the most comfortable foot wear for a fellow who hasn't walked in 50-years. Funnily enough, I found a bright orange color for the All-Stars, but ... well, I gave up and went to the Converse website to see just what colors were made. Imagine my surprise when I found that it's possible to order a custom-made pair. And so I did. 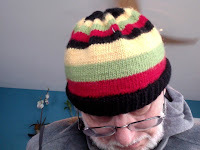 In Rastafarian colors to match my Peggy Vincent custom knitted hat. Even stranger, the special order shoes were only ten bucks more than I paid for the last pair I found at the local mall. Not bad, right? Most Internet orders come with tracking numbers. It turns out that the last person to touch my Rastafarian Converse All-Stars was in Guangzhou, China, which is a city northeast of Hong Kong. Six days from China to the Ozarks of Missouri. Perhaps if Tom Hanks had been wearing Chuck Taylor Converse All-Stars he wouldn't have spent all those years on a deserted island with Wilson. Oh, yes. Hanks was Fed-Ex. My Rastafarian All-Stars rode UPS. It's a strange new world we live in, thanks to this marvelously addictive and utilitarian thing we call the Internet. You'll notice that Converse even allows for the addition of a personal logo. Mine is, considering space allowances, LIV2RYD, which I hope translates to "Live to Ride" if it is visible. Thanks for the shoes! They fit perfectly. I hope your working conditions are decent. Heating, air conditioning, and all that. Plenty of breaks. Access to good food on site. Tolerable hours—say, no more than nine or ten a day, counting commute—with no more than five-and-a-half days a week, maximum. And pay. I hope you get a living wage, at least enough so a husband and wife working together can earn enough for ample shelter, proper nutrition, good education for the child, and maybe a vacation every year.